Endeavors In Education: Whole Class Journals in use! Whole Class Journals in use! 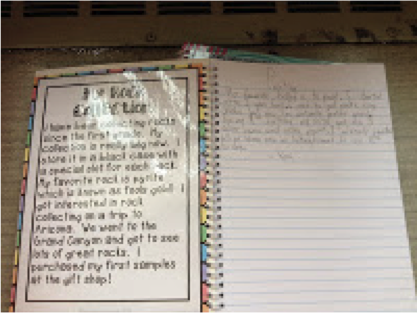 I put out the Whole Class Journals from my TPT store and they have been a big hit with the students. It is one more thing for those fast finishers to do when they have completed their work. I had some extra notebooks lying around that were perfect for this project. I laminated my covers and samples, cut them to size, and glued them on to the notebook cover. I put my finished journals in a book bin with the rules for journal writing displayed as a constant reminder. I think I would have preferred to use binders for this since it would have been easier to put together and the papers can be manipulated easier, but I really didn't feel like having to buy binders when I had these notebooks. Some of the entries have been great and I have gotten to see the extra creative side of my students. It also is nice because it is a place for them to share stories with me and their classmates….the LOVE to share stories. I also created a homophone center packet. I am excited to put that to use soon with the students. I have begun to collect the materials for the homophone search and can't wait until the product is finished. I will do a post on the centers as soon as I have them implemented in the classroom. The homophone search is super easy to make…I laminated the homophone cards, cut them out and then put them into a clear plastic bottle. I used an orange juice bottle. I bought a bag of rice, although I'm not sure that this will be enough rice to fill the bottle.